Within Learning Services is a team of technical staff and part of their remit is to oversee the technology in your teaching spaces, and to provide training and support for the audio visual equipment across classrooms and lecture theatre spaces. The two teams formerly known as Media & ICT Support and ICT Development have now merged to become the Classroom Technology Support Team. This new, merged team gives an enhanced user and support experience, which encompasses the technologies and software you find in your teaching spaces, brought together and supported as one. Many will be aware of the Classroom Support Service that the team operates between 8am and 6pm each weekday during term time, but did you know that this covers 220 teaching spaces across all 4 campuses? The majority of teaching spaces can be supported remotely. You can find details of supported teaching spaces and the technology installed in them in the ‘Everyone’ staff shared folder: Y:\Everyone\Classroom Support & AV. The team also provides support for over 750 PCs in teaching spaces and open access areas, including specialist support for Faculty of Education software and equipment. The digital pathway and road map for teaching spaces allows proactive monitoring of each connected space, and provides evidence around usage and trends. This enables statistical evidence to be provided for future technical enhancements to our teaching spaces. Some of our lecture theatres are now capable of providing an immersive experience, with projection and sound technology you would experience in a digital cinema. Creative Edge lecture theatre has been designed to provide both a teaching environment and a full digital cinema experience with a projection system capable of projecting 2K resolution video. Did you AV a good classroom experience? 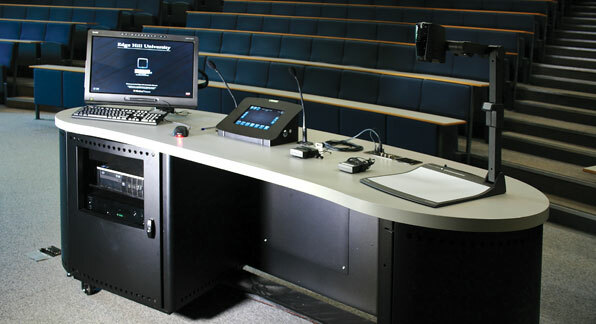 Did you know that Learning Services manage the audio-visual (AV) technologies in the University’s 212 teaching spaces? Installing, maintaining and future-proofing classroom and lecture theatre AV is a bit like painting the Forth Bridge – the job is never completed, however, almost all of EHU’s teaching spaces are now equipped with a high standard of audio-visual equipment such as data-projectors, speakers, Blu-ray players as well as wall or desk mounted control panel with an input socket for laptop if required. As well as managing the high-quality AV kit in classrooms, Learning Services also provides a classroom support service for colleagues. Amazingly, calls for classroom support have fallen year-on-year since 2010 despite a 50% increase in the number of classrooms supported! See Fig 1. While this is a good news story, we are not resting on our laurels, being very mindful that every call to classroom support represents a delay in teaching and that any delay on our part in resolving issues has an immediate, highly visible and often emotional impact upon the student and staff experience. While classroom and lecture theatre control panels have become more intuitive and the AV technology more robust, using them can be a daunting experience for new staff. 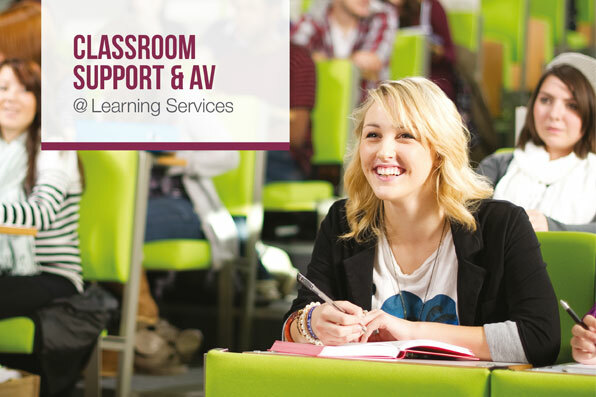 To this end, Learning Services have produced a classroom support brochure, which contains helpful information about the audio visual technologies in classrooms and lecture theatres and who to call on for support when it is needed. We think this information will also be of interest to academic colleagues who have been here a while so will post a booklet out to all. Copies will also be made available at the Welcome desk on the ground floor of the library. There is an electronic copy of our new booklet available in eShare.